You are not a tourist. You are a tide racing, savings chasing Labor Day Weekend warrior. Tame the Jaguar's Paw zip line in Belize. Swim with sea turtles in Barbados. And when you book your next adventure during our Labor Day Sale, you'll save 50% off your second guest and 25% off third and fourth guests — plus score a bonus. Come Seek the Royal Caribbean®. *Visit your travel professional for complete terms and conditions. Non-refundable deposit booking ("NRDB") cancelled prior to final payment due date will receive a future cruise credit in the amount of the deposit minus a $100 per person service fee ("FCC"). FCC is non-transferable and expires after 12-months from issue date. $100 per person service fee applies to changes to NRDB ship or sail date. Deposits made toward Guarantees and Grand Suites and higher categories are non-refundable and are subject to NRD Booking Terms. Cruise must be booked between 9/1/17 through 9/5/17 12:00 AM the "Offer Period". Offer applies to sailings departing on or after 10/1/17. Offer includes 50% off cruise fare of second guest booked in the same stateroom as first full fare guest and 25% cruise fare savings for 3rd and 4th guests booked in the same stateroom as first two qualifying guests. Labor Day sale provides onboard credit determined by category booked and sailing length: $25 to spend onboard for interior and oceanview on sailings 5 nights or less, $50 to spend onboard for balconies and suites on sailings 5 nights and less, $50 to spend onboard for interior and oceanview on sailings 6 nights and longer, $75 to spend onboard for balconies on sailings 6 nights or longer, and $100 to spend onboard for suites on sailings 6 nights or longer. Deck the Holidays Deals offer provides additional onboard credit for guests who book a holiday sailing departing from 12/19/17 through 12/31/17 and 12/18/18 through 12/31/18. Offer includes an onboard credit determined by category booked and sailing length: $25 more to spend onboard for interior and oceanview on sailings 5 nights or less, $50 more to spend onboard for balconies and suites on sailings 5 nights and less, $50 more to spend onboard for interior and oceanview on sailings 6 nights and longer, $100 more to spend onboard for balconies on sailings 6 nights or longer, and $150 more to spend onboard for suites on sailings 6 nights or longer. Offer excludes China departures. NRDB that are booked six months or more prior to the cruise departure date are eligible to receive a per stateroom onboard credit ("OBC") in the following amount: for sailings 5-nights and less, $25 OBC for interior and oceanview, and $50 OBC for balcony and suite; and for sailings of 6-nights and longer, $50 OBC for interior and oceanview, $100 OBC for balcony and suite. OBC is in USD, has no cash value, is non-transferable, not redeemable for cash, and will expire if not used by 10:00 PM on the last evening of the cruise. Offer is combinable with select promotions. Offer applies to new, individual and named group bookings confirmed at prevailing rates. OBC is not redeemable for cash and may expire. Offer open to residents of U.S. or Canada. Labor Day sale and Deck the Holidays offer exclude China departures. Prices and Offer are subject to availability and change without notice, capacity controlled, and may be withdrawn at any time. Refer to www.royalcaribbean.com for complete terms and conditions. You received this message because you provided your e-mail address to Royal Caribbean. To ensure delivery to your inbox (not bulk or junk folders), please add royalcaribbeaninternationalsalespromotion@rccl.com to your address book. If you do not wish to receive any further communications from Royal Caribbean, please click here. 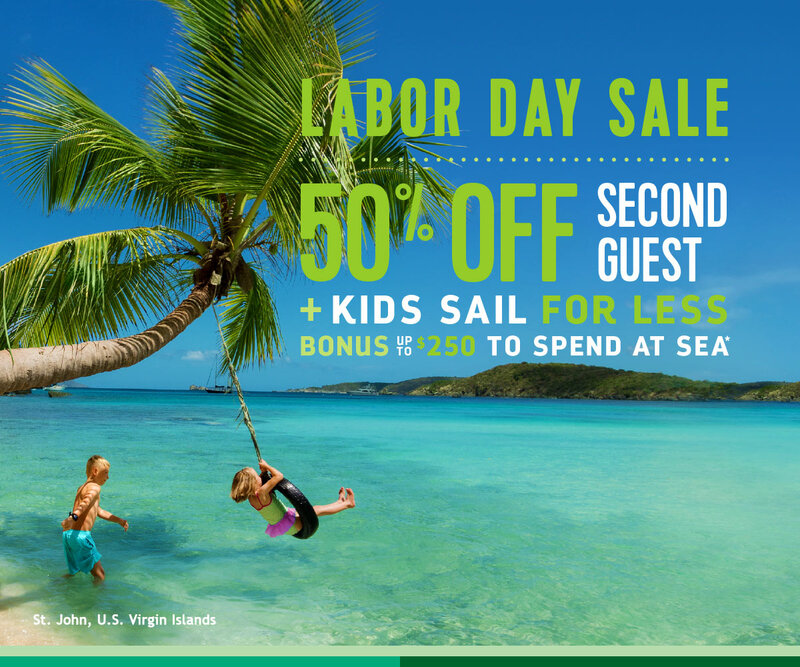 LABOR DAY BONUS — Your clients will score up to $100 to spend at sea when they book during our Labor Day Sale. DECK THE HOLIDAYS — If they sail with us during the holidays, they’ll also get up to $150 extra to spend at sea. EARLY BOOKING BONUS — Early birds will enjoy up to an additional $100 to spend at sea on sailings booked 6+ months in advance through our Non-Refundable Deposit program. any 7-night or longer sailing. Book a cruise between 8/25 and 9/8 for sailings through Dec. 31, 2017 and receive a complimentary Value Booklet for savings up to $500 and FREE Voom - the fastest internet at sea (for 1 device per room, valued at $17.99 per day)!!!!!! *NON-REFUNDABLE DEPOSIT BOOKING (“NRDB”) CANCELLED PRIOR TO FINAL PAYMENT DUE DATE WILL RECEIVE A FUTURE CRUISE CREDIT IN THE AMOUNT OF THE DEPOSIT MINUS A $100 PER PERSON SERVICE FEE (“FCC”). FCC IS NON-TRANSFERABLE AND EXPIRES AFTER 12-MONTHS FROM ISSUE DATE. $100 PER PERSON SERVICE FEE APPLIES TO CHANGES TO NRDB SHIP OR SAIL DATE. DEPOSITS MADE TOWARD GUARANTEES AND GRAND SUITES AND HIGHER CATEGORIES ARE NON-REFUNDABLE AND ARE SUBJECT TO NRD BOOKING TERMS. CRUISE MUST BE BOOKED BETWEEN SEPTEMBER 1, 2017 THROUGH SEPTEMBER 5, 2017 AT 12:00 AM EST THE “OFFER PERIOD”. OFFER APPLIES TO SAILINGS DEPARTING ON OR AFTER OCTOBER 1, 2017. OFFER INCLUDES 50% OFF CRUISE FARE OF SECOND GUEST WHO MUST BE BOOKED IN THE SAME STATEROOM AS A FIRST GUEST WHO BOOKS AT FULL FARE (“BOGO”). OFFER ALSO INCLUDES 25% CRUISE FARE SAVINGS FOR 3RD GUESTS AND HIGHER BOOKED IN THE SAME STATEROOM AS THE FIRST TWO QUALIFYING GUESTS. LABOR DAY SALE PROVIDES ONBOARD CREDIT DETERMINED BY CATEGORY BOOKED AND SAILING LENGTH: $25 TO SPEND ONBOARD FOR INTERIOR AND OCEANVIEW ON SAILINGS 5 NIGHTS OR LESS, $50 TO SPEND ONBOARD FOR BALCONIES AND SUITES ON SAILINGS 5 NIGHTS AND LESS, $50 TO SPEND ONBOARD FOR INTERIOR AND OCEANVIEW ON SAILINGS 6 NIGHTS AND LONGER, $75 TO SPEND ONBOARD FOR BALCONIES ON SAILINGS 6 NIGHTS OR LONGER, AND $100 TO SPEND ONBOARD FOR SUITES ON SAILINGS 6 NIGHTS OR LONGER. DECK THE HOLIDAYS DEALS OFFER PROVIDES ADDITIONAL ONBOARD CREDIT FOR GUESTS WHO BOOK A HOLIDAY SAILING DEPARTING FROM DECEMBER 19, 2017 THROUGH DECEMBER 31, 2017 AND DECEMBER 18, 2018 THROUGH DECEMBER 31, 2018. OFFER INCLUDES AN ONBOARD CREDIT DETERMINED BY CATEGORY BOOKED AND SAILING LENGTH: $25 MORE TO SPEND ONBOARD FOR INTERIOR AND OCEANVIEW ON SAILINGS 5 NIGHTS OR LESS, $50 MORE TO SPEND ONBOARD FOR BALCONIES AND SUITES ON SAILINGS 5 NIGHTS AND LESS, $50 MORE TO SPEND ONBOARD FOR INTERIOR AND OCEANVIEW ON SAILINGS 6 NIGHTS AND LONGER, $100 MORE TO SPEND ONBOARD FOR BALCONIES ON SAILINGS 6 NIGHTS OR LONGER, AND $150 MORE TO SPEND ONBOARD FOR SUITES ON SAILINGS 6 NIGHTS OR LONGER. OFFER EXCLUDES CHINA DEPARTURES. NON-REFUNDABLE DEPOSIT RESERVATIONS THAT ARE BOOKED SIX MONTHS OR MORE PRIOR TO THE CRUISE DEPARTURE DATE ARE ELIGIBLE TO RECEIVE A PER STATEROOM ONBOARD CREDIT (“OBC”) IN THE FOLLOWING AMOUNT: FOR SAILINGS 5-NIGHTS AND LESS, $25 OBC FOR INTERIOR AND OCEANVIEW, AND $50 OBC FOR BALCONY AND SUITE; AND FOR SAILINGS OF 6-NIGHTS AND LONGER, $50 OBC FOR INTERIOR AND OCEANVIEW, $100 OBC FOR BALCONY AND SUITE. OBC IS IN USD, HAS NO CASH VALUE, IS NON-TRANSFERABLE, NOT REDEEMABLE FOR CASH, AND WILL EXPIRE IF NOT USED BY 10:00 PM ON THE LAST EVENING OF THE CRUISE. LABOR DAY SALE AND DECK THE HOLIDAYS OFFER EXCLUDE CHINA DEPARTURES. ALL OTHER CHARGES, INCLUDING, BUT NOT LIMITED TO, TAXES, FEES AND PORT EXPENSES, ARE ADDITIONAL AND APPLY TO ALL GUESTS. BOGO DOES NOT APPLY TO THIRD AND HIGHER OCCUPANCY GUESTS. BOGO OFFER IS COMBINABLE WITH NRDB OBC, PROMOTIONAL OBCS AND INSTANT SAVINGS, NEXTCRUISE OFFERS, RESTRICTED DISCOUNTS (FOR EXAMPLE, SENIOR, RESIDENT, MILITARY), CROWN AND ANCHOR DISCOUNTS AND SHAREHOLDER BENEFITS. DECK THE HOLIDAYS SALE IS COMBINABLE WITH NEXTCRUISE OFFERS, NRDB OBC, AND RESTRICTED DISCOUNTS (FOR EXAMPLE, SENIOR, RESIDENT, MILITARY) BUT IS NOT COMBINABLE WITH SHAREHOLDER BENEFITS AND CROWN AND ANCHOR DISCOUNTS. BOGO50 BOOKINGS MADE FOR CHINA DEPARTURES ARE COMBINABLE WITH NEXTCRUISE OFFERS AND CROWN AND ANCHOR BALCONY/SUITES DISCOUNTS ONLY. ALL OFFERS ARE NOT COMBINABLE WITH ANY OTHER OFFER OR PROMOTION, INCLUDING, BUT NOT LIMITED TO, STANDARD GROUP, INTERLINE, TRAVEL AGENT, TRAVEL AGENT FRIENDS AND FAMILY, WEEKLY SALES EVENTS, NET RATES. AFTER THE OFFER PERIOD, THE OFFER WILL BE REMOVED FROM THE BOOKING IF THE GUEST CANCELS AND REINSTATES THE BOOKING OR REBOOKS INTO A NEW BOOKING ON THE SAME SHIP AND SAIL DATE, APPLIES A FARE CHANGE, OR CHANGES THE SHIP OR SAIL DATE OF THE BOOKING; CERTAIN OTHER CHANGES TO THE BOOKING MAY ALSO RESULT IN REMOVAL OF THE OFFER. OFFER APPLIES TO NEW, INDIVIDUAL AND NAMED GROUP BOOKINGS CONFIRMED AT PREVAILING RATES. INDIVIDUAL RESERVATIONS MAY BE TRANSFERRED INTO AN EXISTING GROUP, ASSUMING REQUIRED CRITERIA ARE MET, THOUGH FULL DEPOSIT WILL BE REQUIRED AT TIME OF TRANSFER. FAILURE TO APPLY THE REQUIRED FULL DEPOSIT AMOUNT MAY RESULT IN THE CANCELLATION OF THE BOOKING. SINGLE OCCUPANCY GUESTS PAYING 200% CRUISE FARE ARE ELIGIBLE FOR FULL AMOUNT OF OFFER; SINGLE OCCUPANCY GUESTS PAYING LESS THAN 200% CRUISE FARE ARE ELIGIBLE FOR A PRORATED AMOUNT OF THE OFFER. OFFER AVAILABLE TO RESIDENTS OF UNITED STATES AND CANADA. PRICES AND OFFER ARE SUBJECT TO AVAILABILITY AND CHANGE WITHOUT NOTICE, CAPACITY CONTROLLED, AND MAY BE WITHDRAWN AT ANY TIME. REFER TO WWW.ROYALCARIBBEAN.COM FOR COMPLETE TERMS AND CONDITIONS. ROYAL CARIBBEAN INTERNATIONAL RESERVES THE RIGHT TO CORRECT ANY ERRORS, INACCURACIES OR OMISSIONS AND TO CHANGE OR UPDATE FARES, FEES AND SURCHARGES AT ANY TIME WITHOUT PRIOR NOTICE. ©2017 ROYAL CARIBBEAN CRUISES LTD. SHIPS REGISTRY: BAHAMAS.